iNacol, the International Association for Online Learning, publishes Standards for Quality Online Teaching. Standard D: The online teacher promotes student success through clear expectations, prompt responses, and regular feedback. Standard G: The online teacher demonstrates competencies in creating and implementing assessments in online learning environments in ways that ensure validity and reliability of the instruments and procedures. Standard H: The online teacher develops and delivers assessments, projects, and assignments that meet standards-based learning goals and assesses learning progress by measuring student achievement of the learning goals. 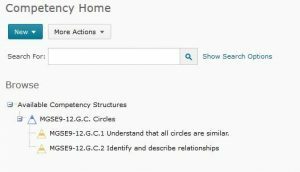 Standard I: The online teacher demonstrates competency in using data from assessments and other data sources to modify content and to guide student learning. The Evaluate module taught me how to combine a number of diverse evaluation methods to promote active learning and mastery of skills. 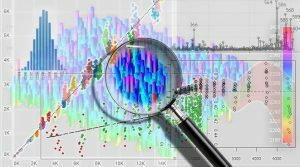 It broke down the importance of data and data analysis in today’s classrooms and how to use a variety of data source to make informed decisions regarding curricula, student performance, and overall achievement. The Evaluate module taught me how to promote student success through clear expectations, prompt responses, and regular feedback (Standard D) as shown in the following post: http://andreajahall.edublogs.org/2017/05/31/evaluate-1-quality-feedback/. 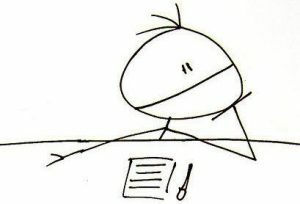 I learned how to develop and deliver assessments, projects, and assignments that meet standards-based learning goals and assesses learning progress by measuring student achievement of the learning goals (Standard H) as illustrated in this lesson: http://andreajahall.edublogs.org/2017/05/31/evaluate-1-the-summative-assessments/ . 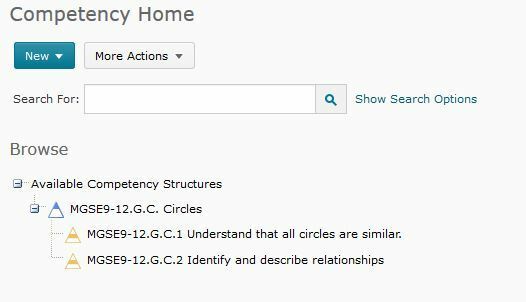 Finally, I was able to demonstrate competency in using data from assessments and other data sources to modify content and to guide student learning (Standard I) as shown in the following post: http://andreajahall.edublogs.org/2017/06/02/evaluate-3-personalized-teaching-and-learning/ . The lessons which I found that were most beneficial to me was the lessons on Personalized Teaching and Learning. I never thought of having posts show up for students based on their score on a particular assessment. I definitely plan to implement that strategy in my teaching. 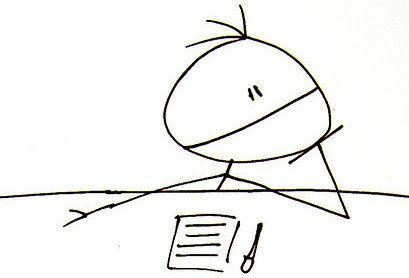 Some strategies I will take away from the Evaluate module include: customized posts based on student performance on assessments/assignments, I will continue the practice of self-reflection and finally, using the various data strategies to monitor student performance and make adjustments to my teaching when necessary. Self reflection is very important to professional growth. It helps to identify strengths and weaknesses as an educator. Here is a link to my ePortfolio which includes my own reflections through out my career as an online educator: Andrea Hall’s Professional Development ePortfolio. The Spring 2015 Student Survey reports were very informative. This semester I added questions to help me develop better weekly chat sessions/open office hours. I learned that having the weekly chats on Mondays were good for the majority of students and having them occur at 7pm in the evening was perfect for them. I was hesitant that it might be too late but I had the most turn out this semester than in times past with this later time. Some students made the comment of wanting more time in the chats to ask questions and to get more details. Upon reflection, have a 90 minute weekly chat/office hour might be something I might want to consider in the future. Another student mentioned wanting a weekly check up phone call to keep them on track. While this might not always be feasible, I think setting up a weekly appointment time for students who are falling behind from the beginning to call me (besides the monthly failure calls) might be something I would want to consider. Overall, it was a great semester. The student appreciated my feedback and my availability as a teacher. 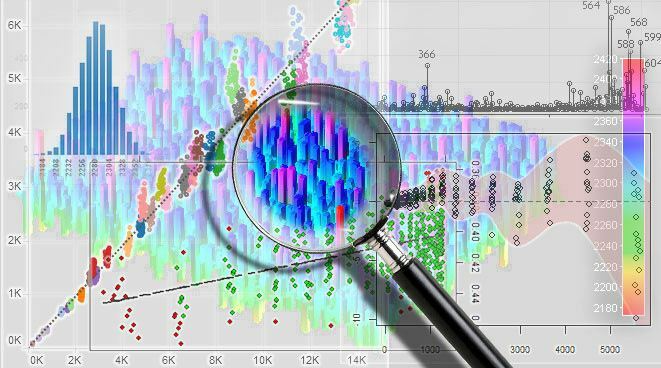 There are several data analysis tools available for teachers to utilize when evaluating their course and their performance. 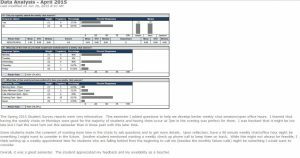 In addition to the Analytics Portal in Brightspace, there are evaluations from EvaluationKit which house the results from student and parent surveys. 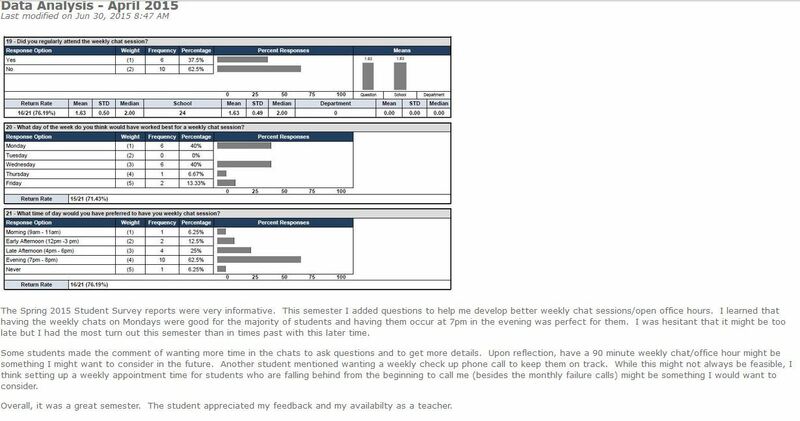 I learned from this survey that students appreciated the feedback and that 100% found it very helpful. 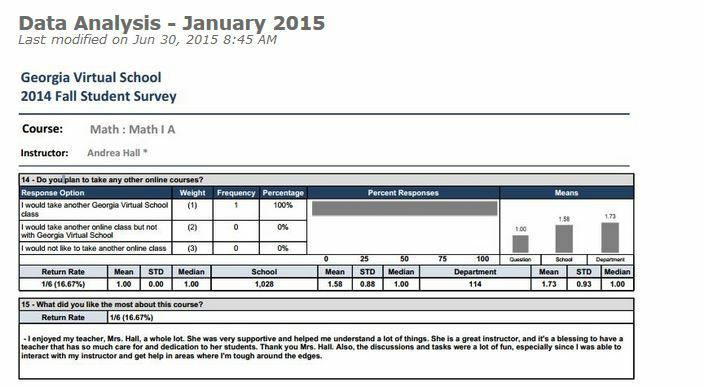 I plan to keep on giving instructive feedback and improve my grading turn around. When teaching Algebra IB this school year I decided to do a heatmap to see how students were performing on the assignments. Below is a sample of a heatmap that I did on my students in my course. By doing this remediation plan many students were able to bring up their grades. Another way that I can create a personalized learning path to help students struggling in other lessons besides the four that I identified for the class is to create customized and conditional news announcements that would only show to students who made certain scores on assessments that I identified. 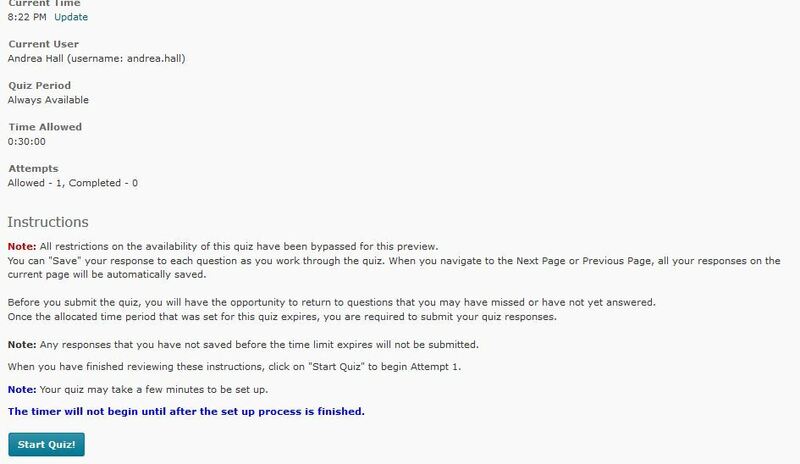 This way if a student failed a quiz, they would automatically see a news announcement the next time they logged in offering extra help. Using all this data can help me differentiate learning for my students in a more productive manner. Instead of taking a stab in the dark, I know exactly what I need to be targeting. MGSE9-12.G.C.1 Understand that all circles are similar. MGSE9-12.G.C.2 Identify and describe relationships among inscribed angles, radii, chords, tangents, and secants. Include the relationship between central, inscribed, and circumscribed angles; inscribed angles on a diameter are right angles; the radius of a circle is perpendicular to the tangent where the radius intersects the circle. I used MGSE9-12.G.C. 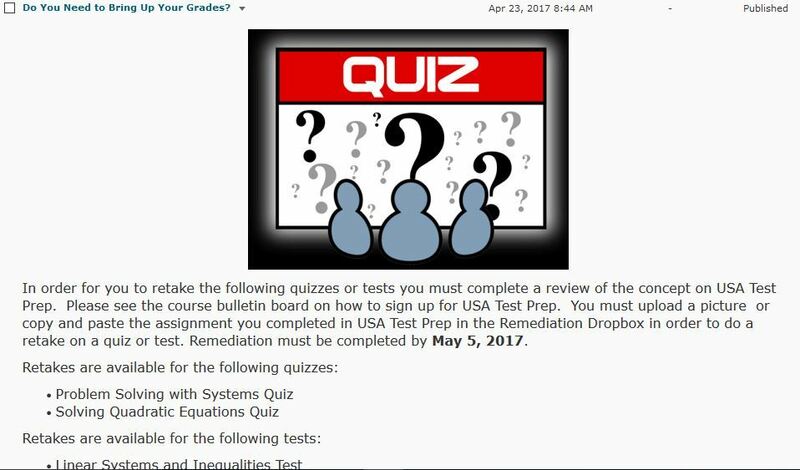 as the code so that it directly correlates to the standard so that as students are preparing for the EOC Milestone Exam they know which standards they need to work on based on the results from their associated assessments. Data Instruction and Analysis is very important to online teachers and it starts from the beginning. My online school uses an student information system called TheSIS to track when students enroll. I can monitor their attendance, and communication logs. In the following example I am able to see the student names (blocked due to FERPA), the student type (if they have an IEP or 504 Plan), whether or not they have completed an orientation module (there is an orientation date after their registration date), if they have dropped, and whether or not each student plans to take a state standardized test with the course (EOC). Specific student names, parent contact info, and other data are available and can even be downloaded into an excel sheet. The following is an example of the communication in TheSiS which keeps track of what information has already been shared with students and parents. This is a new course so only the welcome email has been shared thus far. A teacher might adjust the course in the future based on the previous activities of students in several ways. First, by using the analytics tools such as the heatmap the teacher can see which topics or concepts students seems to struggle with the most. The teacher can then proactively prepare a special presentation to counteract the common misconceptions or mistakes. Second, a teacher can determine if certain assessments need to be revised because they do not directly correlate to the standards or other tests. Using data for online instruction makes the online learning environment more targeted. Teachers can tell if students are working steadily in the course or waiting till the last minute and speak to that student. Teachers can provide targeted remediation when they notice that the majority of student are not passing an assessment. Teachers who utilize data have a great advantage over those who do not. In the virtual classroom while you may not “see” the student in class and tell when they are dozing off, teachers who use data can. They can suggest ways students can improve or assist parents in understanding why their student is struggling with a particular aspect of the curriculum. 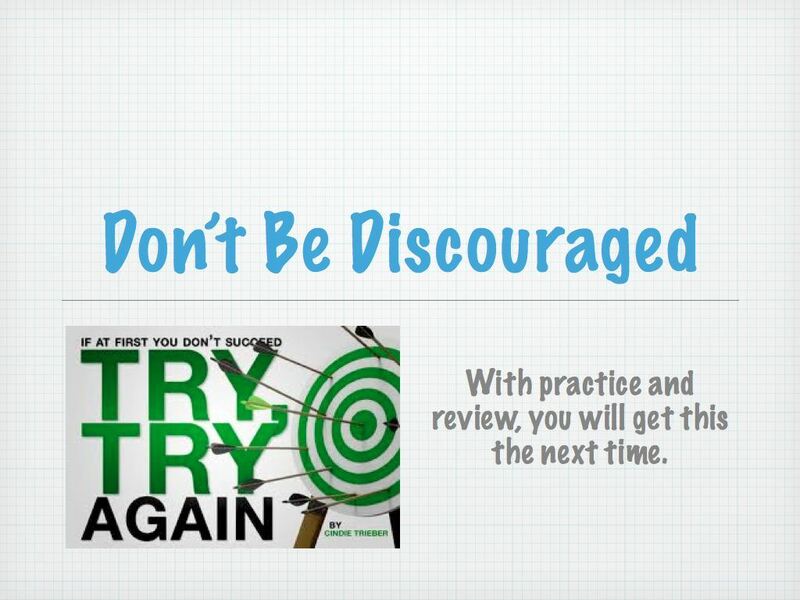 Feedback should assist students in meeting and exceeding expectations and is the cornerstone of success. It should be customized and propel the student to strive for better performance or for deeper thought and application. It is important for an instruction to consider student performance data when providing feedback to see if there are any trends or additional insights as to the students performance. It is both observational because you are looking at the students performance in a real way as well as instructional because you can use their performance to help inform your class presentations in addition to helping the student learn from his/her mistakes and do better next time. 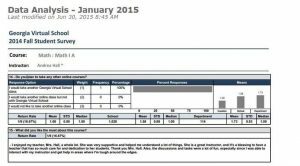 With this assessment, students were able to make changes and resubmit for a higher grade. If students still did not understand the assessment, additional instruction would be provided before the summative assessment. Here is an assessment that I created called Function and Function Notation Test. This test would be uploaded to a Learning Management System and administered to students online. In order to determine the validity of the test I used the Georgia Milestone EOC Guide for Algebra I to see the high priority standards. This helped to determine which standards from the Georgia Standards of Excellence and goals were more important. In order to determine the reliability of the test I made sure that the test measured related content. 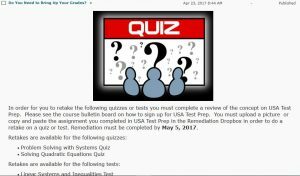 The test would be administered online and students would all be given the same amount of time and the same amount of questions. A teacher can employ numerous ways to assess student readiness for course content and method of delivery. Edutopia’s Assessment group shared different types of formative assessments. I will start off with a tool shared by The Adventures of Library Girl called Lino. This tool can be used as a formative assessment because it enables students to post to a whiteboard and assess their readiness for the content. Another similar tool shared by the Edutopia’s Assessment group is Padlet. Another method for formative assessment mentioned is the use of mini- whiteboards in which “each student, or groups of students, has a mini-whiteboard. As they work through problems, they can share them either with you as a class, or you can walk around the classroom and see their work.” While in the virtual environment this may not be possible but you can use a poll in the live virtual class session as a way of getting immediate feedback as well as create discussion groups in which students can work together. The West Virginia Department of Education suggested the use of an exit slip in which you give students a quick quiz or ask them 3 Things I learned today-2 Things I found interesting-1 Question I still have. 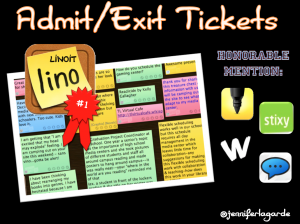 I created a sample exit slip using the 3-2-1 method that I plan to use here: http://goo.gl/forms/2duuU2RXCW. I currently use a different type of exit slip found here: http://goo.gl/forms/rN6NfQx3pN. There are so many different forms of formative assessments which cannot all be discussed in this post. However, one more important point to mention is that many virtual whiteboard classrooms have checking tools like thumbs up and thumbs down in addition to their polling options which make it possible to get immediate feedback although you cannot physically see the student. I created one more formative assessment to determine student readiness for a lesson on Expressions, Equations and Functions which is used to determine if students know the properties of functions and can add, subtract, multiply and divide functions. This is a game and the link to this assessment can be found by clicking here http://reviewgamezone.com/game.php?id=24688. 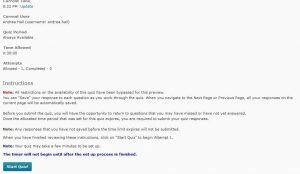 Once students complete this assessment I am able to create additional help videos to make sure that students are prepared for the summative assessment.